The new Moto Guzzi V7 II has thus baptized in the tradition of the factory in Mandello del Lario and available in three different versions, each with its own identity: Stone, Racer and Special. It is the new generation of one of the most popular models of the brand of “Eagle” a bestseller anywhere in the world. This new model is the first to make its debut with a long list of safety and technical performance, with a new six-speed automatic transmission with a gap between the gears that has resulted in the reduction of space between the gears to lower revolutions between gear and another. It has also improved the clutch to achieve a smoother drive and a more uniform release. In line with increased security, the new V7 II incorporates ABS braking system and MGCT, exclusive traction system of Moto Guzzi. The first is a two channel system, while the second is a sophisticated electronic system which ensures great traction in any condition. In addition, prevents locking of the rear wheel during acceleration avoiding the dangerous loss of grip to increase driving safety. The rear axle has new stability by increasing the negative path of the suspension, obtained by reducing in 50 mm the output of the drive shaft, which provides a greater adhesion of the tire in the load transfers, in the braking and the change in direction. Regarding aesthetics, the new V7 II engine has tilted 4° toward the front axle and lowered 10 mm. This solution, in addition to considerably improve the aesthetics from a side view, has also created more space for knees. The new VII has the stirrups 25 mm lower and provides a more comfortable position even for taller riders, while remaining accessible to all users. 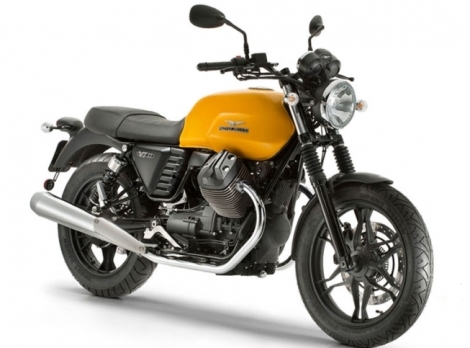 The new Moto Guzzi V7 II is available in three versions: VII Stone, characterized by a combination of 70s color style. It differs in that the wheels are light alloy. The V7 Special II, the closest to the original spirit of the model with graphics inspired by the famous 1975 V750 S3 has a protection in the fork legs instead of the dust sleeves that are equipped with all other models range. The V7 Racer II is characterized by sportsmanship.